It is Monday. Note my specific avoidance of the phrase “Happy Monday”. I don’t want to be a downer, but Monday mornings are tough, and if you are like me, you are not fully yourself until well after lunchtime.Believe it or not, having breakfast is a big part of feeling ready to tackle your day. It seems so easy to skip this meal in favor of sleeping in an extra 15 minutes, or grabbing some greasy breakfast sandwich at a fast food joint (I’ll admit this is a guilty pleasure on special occasions), but trust me, with either of these options, you are not doing yourself any favors. I work/study from home, so you’d think it would be easy for me to whip up a fabulous breakfast of eggs and homemade scones every morning, but I’ve got a schedule to keep to just like everybody else, and if I barely have the energy to shower when that alarm goes off, I’m certainly not going to make a gourmet meal either. However, I do have the energy to press a button, and that’s why I love my go-to energizer breakfast, the smoothie! There are probably thousands of smoothie recipes under the sun, and you should definitely experiment to find the fruits and add-ins that you like, but my Rise and Shine! Smoothie points out a few key things. First of all, frozen fruit. Gasp! But seriously, there is no harm or shame in using it. For one thing, I don’t know about you but I don’t live in a paradise where fresh Summery fruits are available year round. And a lot of the time, not to burst any bubbles, the stuff they ship frozen is fresher than what you actually buy fresh. When you buy a pint of berries, you don’t know how long they’ve been sitting in your grocery store, let alone how long they took to get there. But most frozen fruit is frozen at the peak of it’s freshness, and that freshness is preserved in its icy state. So it’s convenient and delicious. Not to mention, rather than adding ice to your smoothie, frozen fruit pulverizes to the perfect consistency. And a second thing to note in this recipe, you don’t need a fancy expensive juicer. I have a cheap blender, and it does just fine. *This will make about 12 ounces, or 1.5 cups. 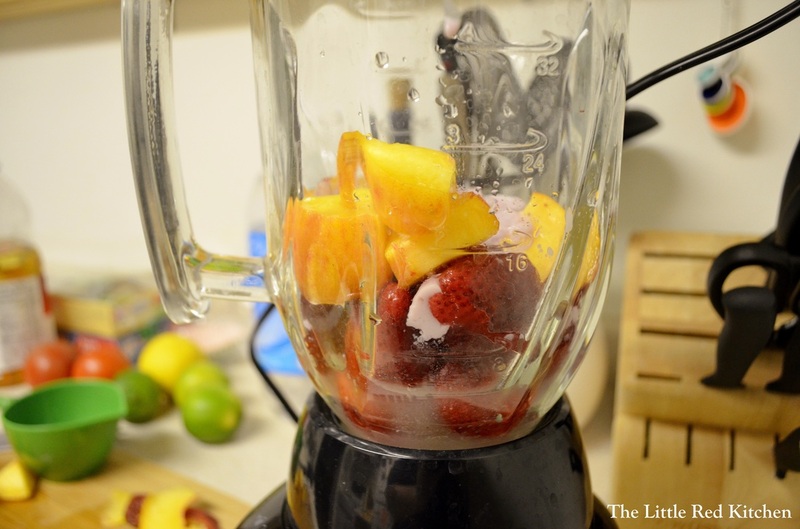 Throw the fruit into the blender, followed by the yogurt and apple cider. Blend on a high setting for about 15 seconds, until smooth and creamy. Note, sometimes you may have to add a bit more liquid to the mix. 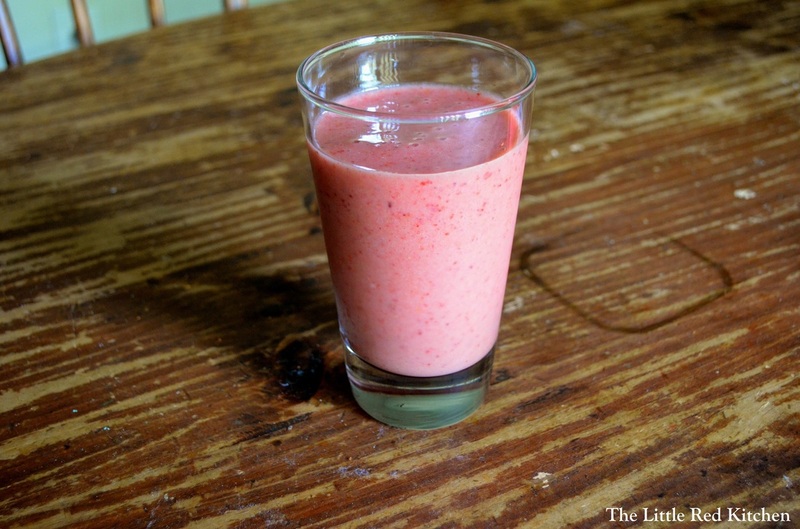 If after 15 or 20 seconds the concoction is still chunky and well, NOT a smoothie, drizzle in a bit more cider.This smoothie is smooth, cold, sweet and slightly tangy. In a word, delicious.